Steven (Chicagoland, United States) on 21 July 2010 in Documentary & Street and Portfolio. "Shortly after the release of Associated Press Photographer Joe Rosenthal's famous photo, Sculptor Felix W. de Weldon, then on duty with the U.S. Navy, constructed a scale model followed by several life-sized statues inspired by the scene. It was then proposed that the symbolic scene be immortalized in bronze. 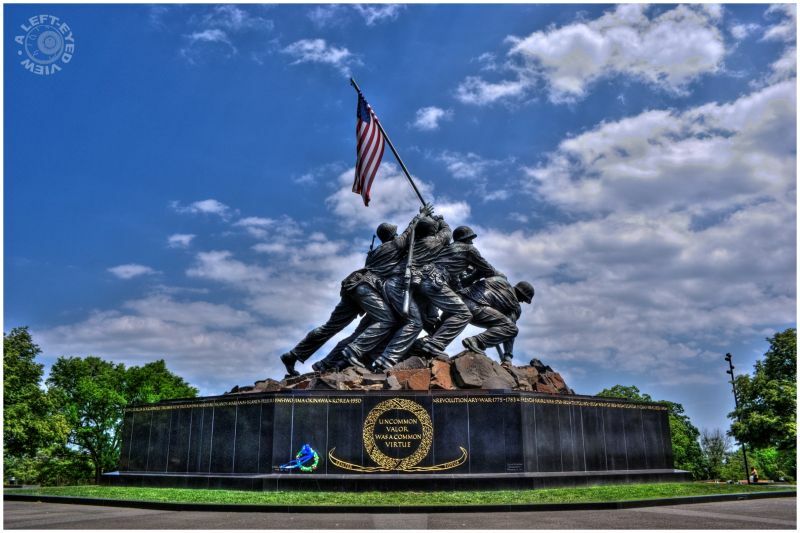 The Marine Corps Memorial Foundation organized the fundraising and creation of the monument. After years of effort, Felix de Weldon and his assistants completed the statue...."
Regardless of what angle this memorial was photographed, I found it to be just as powerful as the last, revealing faces, emotions, and struggle. Photographed on May 6, 2010. Superb photo and the composition is excellente. So, le sky with the clouds are very beautiful. Very good work. Have a lovely afternoon Steven. Yes This is a wonderful perspective Steven...did the expressions on the faces seem to be perhaps an inspiration to the artists who did the Korean and Vietnam ones or are they all different? Gorgeous! I like this tighter framing, too.